The moral of the story is: be careful what you wish for. Sure, it is great to see Nico Rosberg and Williams leading the times and refreshing to watch the forgotten drivers suddenly vying for the top eight places, but then one notices the plight of the heroes of previous seasons. Why aren't they higher up the grid, we ask, even though we expected this. Old habits die hard, it seems, and still we think that the Kimis and Lewises, the Felipes and Fernandos will pull a rabbit out of the hat come qualifying. On the evidence of practice, however, that looks increasingly unlikely. The double-decker diffuser is clearly a big advantage - when six of the best seven times are occupied by the diffuser bunch, it is impossible to think otherwise. The man who stands out for me is Mark Webber. To be fourth fastest without any assistance from a fancy diffuser is impressive; and the performance of the other Adrian Newey drivers shows that the car is nothing special. Round one to Webber in his battle with Vettel (who seems to be drawn to grassy edges suddenly) and a hint that Mark will not just roll over for the German wonder boy. Perhaps the most telling indicator is the position of the Force India drivers. Ninth (Sutil) and thirteenth (Fisichella) is considerably higher than anyone expected for the team and I think this shows that the teams behind them have a little left before they show their true speed. Come qualifying and we will probably find the Force Indias struggling to make it into Q2 again, McLaren, BMW and Ferrari having optimized their settings by then. But the big boys are going to find it hard to get as far as Q3. Six of those spots are more or less reserved for the diffuser bunch,Webber and Vettel will probably account for two more, leaving only two up for grabs. There will be a fight for pole, that is for sure, but the battle for Q3 could be even fiercer. As for that magic pole position, Rosberg is the obvious choice after his tremendous display in practice. I think Brawn GP have not fully shown their hand as yet, however, and I would not be surprised to see Jenson or Rubens leading the parade lap on Sunday. All in all, we have what we asked for - a big shake-up in the order, new or forgotten names coming to the fore, and the rich and famous having to fight to retain their ascendancy. Let us hope that every race is as difficult to predict as this one surely is! I am amazed that BMW are so low down the ranks and it sounds like they are having major problems as Kubica has said the car is unrecognisable! Also I am surprised that Ferrari are so low too. Maclaren is not such a surprise, however if the rumours are true (regarding a late ariving crate etc) it appears that they may have a double decker diffuser to put on their car (They have certainly been very quiet on the whole diffuser issue). I have also read that both Maclarens could clearly be heard lifting off the throttle at certain parts of the track (especially hamilton). The other strange thing is that Hamilton was one of the fastest drivers in sectors 1 and 2 yet dropped over 2 seconds in sector 3. The maclarens are also the fastest on the straits which points towards their KERS system working well. According to one person I work with (whose partner works for ferrari (boooo...) ) it could be the KERS teams that suffer due to the weight problems. Although I can't believe that teams such as Ferrari, Maclaren, Renault and BMW would be running it if it gave them a clear disadvantage. However I really hope Williams and Brawn both get on the podium. Whatever happens I imagine the real race drivers such as Alonso, Kimi, Hamilton etc will be a joy to watch this season. Kubica is obviously not enjoying the BMW at the moment and the lap times show it. If you read the post-practice comments from Heidfeld, however, he sounds quite chirpy in spite of the times and the rest of the team don't seem at all worried either. It may be that they are doing their usual thing of preparing for the race, then using the Saturday morning session to look at qualifying set up. I hope so, anyway! Ferrari are lower than we expected but, again, I think they were not really concerned about quick times; they'll be up there come qualifying. As for McLaren, who knows what they're up to? Kovalainen seems to be quick sometimes and then goes back to being slow, Hamilton looks as though he might be bluffing (but why would he?). I think we'll see some improvement but they are still going to find it hard to get into Q3. And it will indeed be interesting to see how the stars cope with racing in the midfield. That should be very entertaining! Well, I'll tell you something. I don't like it. I have a feeling that the wrong names are in the wrong places. Point. This is a mess. Maybe that diffussor is completely legal, and Ross Brawn and co are the best talking about engineering on the edge. But, I seemed to remember, that what was behind this massive technical change was to give drivers ability just the principal role in the opera. And now we have to admit that the Nakajimas, Sutils, Glocks, Fisichellas, Buttons, are at the front of the pack, because of a mechanical factor. This is silly, brother. Let's clarify a point. The guys that last year were battling for the champ are the real ones, the best of the grid. Kubica won his World Series by Renault, outclassing the rest of the pack. 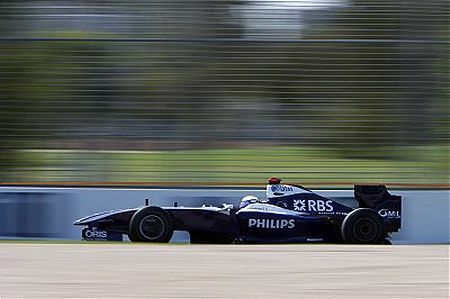 Kimi was signed by Peter Sauber after a single test because the guy was as fast as a lightning. I don't have to say a word about Lewis that you haven't heard yet. And Fred... he gave a run for their money to the jordans, renaults, arrows and other stuff with that 2001 Minardi, putting 3 seconds per lap between him and Tarso Marqués. And now, Do I have to believe that Kazuki Nakajima, who is racing because of a comercial trade and engine supply between Williams and Toyota is far better than Lewis, Fred, Kimi, Felipe, Kubica, and co? I want to watch real DRIVERS, and I want them now. And I'm sure that this is what your whole pack of readers is waiting for. I feel your pain, Roger. However, I have to point out that the reason the star drivers are so highly regarded is partly because they have had the best cars until now. Most of the drivers have been successful in lesser formulae and what separates them in F1 is the difference in performance of the cars they end up in. Yes, a truly great driver can make up some of the difference if he is in a poor car but, because the difference between F1 drivers is so small, he can only do so much. You are assuming that Raikkonen, Alonso, Hamilton and Kubica are the great drivers of today but the truth is that Rosberg, Button, Barrichello, Heidfeld, maybe even Sutil and Nakajima (I couldn't care less how he got his drive - just read his lap times), are just as good. They have never had a car sufficiently good to prove it before, that's all. That is what makes this season so interesting. At last we are going to see just how good the accepted stars really are. Now the boot is on the other foot and they are going to have to compete in less than the best cars. Some we know will be equal to the task - Alonso and Raikkonen have done their time in poor cars. Others may surprise us with their inability to fight through disadvantage. And the drivers who now have good cars will have to give of their best if they are to capitalise on what will certainly be a brief advantage. Some will become stars equal to our present heroes (watch Rosberg especially) and others may prove disappointing. The long ascendancy of just a few teams has accustomed us to a handful of drivers doing all the winning and perhaps blinded us to the talents of those with inferior equipment. But the stars are not somehow sacrosanct and it is good that they should be tested as they will be this season. I feel the interest to find out how much fire can take some of the prima donnas, of course it will be funny... but, another matter of question is that this technical revolution was to give more weight to the drivers side of the equation. And now we are given just the opposite. That's the main point. And about drivers, I have a single way to make my measure. There are drivers who pay to race and there are drivers who buy their seats. The big names we all know, they never ever had tu put a cent off their pockets... We can agree that Rosberg is one of them, for sure. But... Adrian Sutil???. Listen. In 2001 Fred won Fisi driving a Minardi, with 0 km of testing and no experience at all.... This speaks miles of the abilities of each other. Fair point about the change in the regulations being meant to allow more overtaking, Roger. And it's true that, thanks to the diffuser issue, the car advantage has merely swapped around to favour teams that haven't seen the front of a race for a long time. That will sort itself out as the other teams get their own versions of the diffuser and we will have something closer to parity between the cars. You will never attain exactly equal performance between the cars, however - unless you standardise them, of course. Some teams will always have better designs than others; that is F1 and it means that we watch for the brilliance of the designers as well as the skill of the drivers. I don't think any of the drivers in F1 at the moment pay for their seats, unless you regard Buemi's Red Bull sponsorship as payment. They are all paid to drive, some more than others. Money is an awful measure of a driver's ability - if it were not so, Raikkonen would have blown away Massa so comprehensively that Fernando would be sitting in his Ferrari by now. It hasn't happened and I have to conclude that Kimi is not as good as Ferrari thought. Comparing against team mates is about the best way of measuring drivers against each other and I would agree that Alonso has proved that he is quicker than Fisichella. But that doesn't mean that Fisi is useless - just that he's not quite as fast as Alonso. Until he met Fernando, Giancarlo had beaten every team mate he was presented with so he can't be totally rubbish. Kubica won his world series by outclassing the field. There was not a decent driver in the championship. The drivers behind Kubica in the championship were Adrian Valles, Markus Winkelhock, Tristan Gommendy, Felix Porteiro, Andreas Zuber etc etc. Not a decent driver on the grid. Judging drivers can be difficult. Even judging them against their team mate has its pitfalls. In 2007 Kimi was better than Massa and in 2008 it reversed. I don't for a second believe any driver's ability changes significantly from year to year. Some drivers are more suited to one car than another. Lewis Hamilton at the start of 2007 was asked which of the young drivers he knew from his junior career would do best and he said Sutil was the best of the group. In less than 10 hours we'll have a pretty good handle on it all...wo't we. I'll be staying up late with a bottle of decent French Bourdeaux and some snacks to kickoff the new season. Don: Yup, I'll be going for the long haul through the night too (minus the Bordeaux, unfortunately). Seeya in Melbourne! What a breath of fresh air! Being a Williams fan, I am cautiously optimistic at what appears to be happening, but worried that the powerbroking teams (read Ferrari) will get these diffusers banned. Reading "non-diffuser" teams complaining about the things, even though they've been judged legal twice, is starting to get on my nerves. Did Williams keep complaining while they were being beaten by anywhere from $50m - $300m every season? Did they say "it's not fair"? The answer is no. They tried to get better; a major rule change came along and they look like they've achieved their goal. That's what the sport is about, and that's part of what I love about it. If the diffuser add-ons are found to be illegal at the Court of Appeal, and it's a clear cut decision, then I won't complain. I'll just kick some dirt, sit down with a stiff drink, and wait for Team Willy to try again. Any "big team" fans with a sense of who "deserves" to be at the front and who doesn't should do the same. You may be tested in the same way as your favourite drivers. Welcome to the club. I agree, Clive. For me, F1 is like Enzo said it was--50% man, 50% car. Sometimes good drivers will struggle in bad cars and sometimes mediocre drivers will win in good cars--for me, that's the nature of the beast. If I want to watch a pure driving contest, I will (and do) watch Nascar, IndyCar, or another spec series. As far as the rule changes go, I didn't feel that the intention was to shift that 50-50 balance towards the drivers; I thought the intention was to mitigate the aero obstacles that prevented overtaking. That doesn't necessarily favor the drivers any more than the cars, it just allows for greater mobility for a driver/car combination to move up (or down) the standings in a race. And in that regard, the regulations could still very well fulfill their purpose. And while they may have disrupted the relative pace between them, that doesn't necessarily mean that the great drivers have disappeared from the grid. They're still there, and some of them are still in better cars than they started out with. IIRC, both Alonso and Schumi started out as pay drivers, so it shouldn't be a taint on anyone's record if he goes on to success in stronger cars as they did. Australia has been a great race when I can watch it, because the drivers are not in good form, causing dubious moves and strange accidents, surprising me and making sure I stay awake. You're right, though, the rule changes have mixed things up handily as wanted, though I think midseason form is going to make a few things feel a bit more predictable. Prediction: Massa exits race in the first lap on turn one. I'd be cautious about declaring Sutil the winner of the 2009 Force India intra-team battle at this point. Felipe Massa defeated Fisi pretty comprehensively in the first two rounds of 2004, but then everything flipped over for the rest of the season as a delayed technical component (power steering) came on stream. With KERS turning up for Force India in Spain, the same thing could happen here. Assuming this race isn't one of those odd one-offs that happen from time to time in any case. Well, the new regs might not have made the best drivers jobs easier, but it sure helped to point which teams have the best engeneers. So Newey's Red Bull looks like the fastest non-diffuser car, while Ferrari' looks good but not where they expected and both Brawn and Head's Williams clarealy outclassing Toyota. Clive: I'm waiting for your comments about the qualifying. "the over-rated Vettel" showed why he is rated high by many. He is P3 in a non diffuser car. Webber which IMO is really overrated must really improve his game, if he wants to shine together with Vettel. Qualifying is normally MW strong side, but today he was blown away. Robert Kubica also shows why many, incl. me, rate him much higher than Heidfeld with his P4. Rosberg in P5, where we expected him after seeing his practice times, nice. Looks like first blood to the German "Wonder Boy" ie the "vastly overated Vettel". Frankly if there is anyone overated on the grid it's Webber, a man who isn't going to improve as a driver anymore and with zero wins to show for his tenure. But hey, we all are entitled to our opinions. Some just have stronger facts to back them up. Neither Heidfeld nor Webber were "blown away" by their team mates in qualifying, Hezla. Both Mark and Nick were quicker than Der Seb and Robert in Q1, marginally slower in Q2. Come Q3, Webber was on a considerably higher fuel load than Vettel which accounts for Mark's slower time. Pretty much the same happened to Heidfeld - he was the equal of Kubica until it came to Q3, which Nick narrowly missed. Considering that he was the one with KERS and had less ballast to play with, this was achieved in a car that could not be set up as well as Robert's. One qualifying period does not decide winners and losers in driver battles anyway. Vettel and Kubica may look good at the moment but there is still the race to go and then the season. If the two elder statesmen are "blown away" by their team mates over the season, okay, I'll admit I was wrong - but I want to see it done first. Incidentally, the disqualification of the Toyotas raises Nick into to the top three anyway. He is on a much heavier fuel load than Kubica and might even be going for a one-stop strategy. Nick has proved again and again that he can use pit stop strategy to get ahead of Robert so don't assume the old fox is beaten yet! Steve: First blood, maybe. The race itself may yet prove otherwise. But where are the "facts" that indicate that Vettel is better than Webber? You mean one qualifying session? Heidfeld will start more 40 kg heavier than Kubica and heavier than all others in front of him. Let's see what he can do. The weight information is actually really good thing. It just irritates me how BMW handles qualifying. Arrogant they come in the last minutes, only to realize they have trouble to qualify. I agree totally on BMW's qualifying policy, Hezla - it is frustrating to see them wasting the early minutes of each session sitting in the pits and then having to produce the goods in the last couple of laps. Several times last year this left Nick with no laps to correct a previous mistake and I cannot understand why the team stick to such a strange strategy. But the truth is that Fizzy is still a quick and competent driver, yet to be beaten by Sutil. There have always been doubts about his will to race and at times it looks as though he just allows others past - but that could easily be caused by the deficiencies of his car. I certainly don't write him off (unless it suits me for a point of argument)!